A typical MIM image near the corner of a monolayer WTe2 flake. 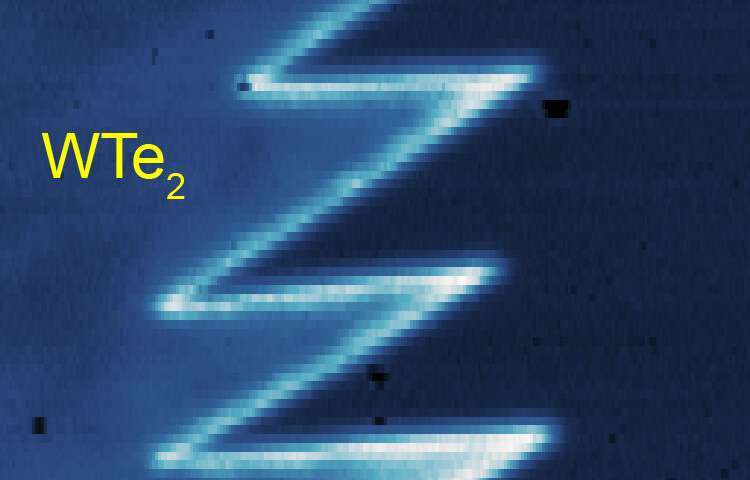 The bright zigzag lines indicate conduction features precisely at the edges of the monolayer WTe2. Credit: Cui lab, UC Riverside. A research team comprised of scientists at the University of California, Riverside, and the University of Washington has for the first time directly imaged "edge conduction" in monolayer tungsten ditelluride, or WTe2, a newly discovered 2-D topological insulator and quantum material. In a typical conductor, electrical current flows everywhere. Insulators, on the other hand, do not readily conduct electricity. In topological insulators, a special type of material, the interior works as an insulator, but the boundaries of such materials are guaranteed to be conductive due to its topological property, resulting in a feature called "topological edge conduction." Yongtao Cui is an assistant professor of physics and astronomy at UC Riverside. Credit: I. Pittalwala, UC Riverside. 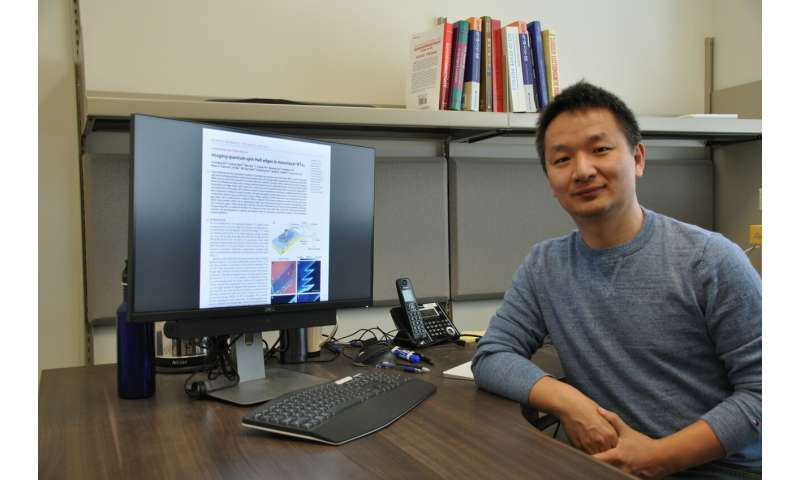 "Several materials have been shown to be 3-D topological insulators," said Yongtao Cui, an assistant professor of physics and astronomy at UCR, who led the research. "But 2-D topological insulators are rare. Several recent experiments established that monolayer WTe2 is the first atomically thin 2-D topological insulator." Cui's lab used a novel experimental technique called Microwave Impedance Microscopy, or MIM, to directly image the conduction at the edges of monolayer WTe2. "Our results unambiguously confirm edge conduction in this promising material," Cui said. Illustration of the measurement setup. 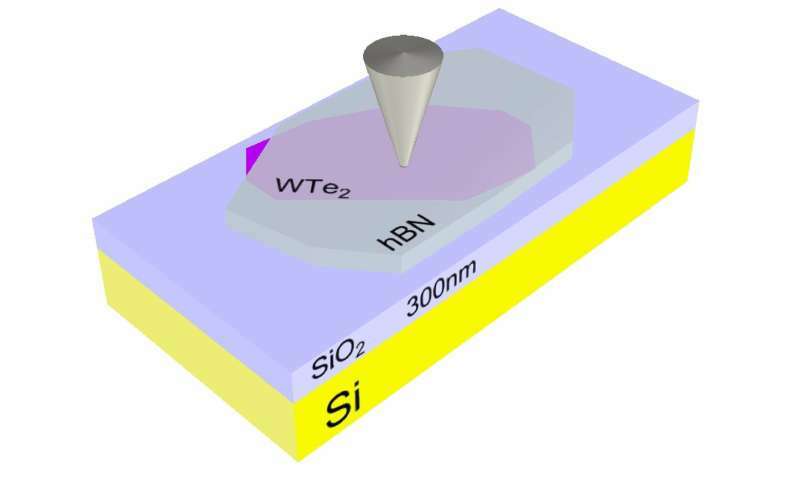 The monolayer WTe2 flake sits on a SiO2/Si substrate and is covered by a thin hexagonal boron nitride (hBN) flake to protect it from degradation. Credit: Cui lab, UC Riverside. "In addition to conduction at the edges in monolayer WTe2, we also found that the conductive channels can extend to the interior of the material, due to imperfections—such as cracks," Cui said. "Our observations point to new ways to control and engineer such conduction channels via mechanical or chemical means." Cui's collaborators at the University of Washington prepared the monolayer WTe2 samples. At UCR, his lab performed the MIM measurement, which involved sending a microwave electrical signal to a sharp metal tip, and positioning the tip near the surface of monolayer WTe2. By resolving the microwave signal bounced back by the sample, the researchers could determine whether the sample region directly below the tip was conductive or not. "We scanned the tip across the entire sample and directly mapped the local conductivity," Cui said. "We performed all the measurements at cryogenic temperatures, needed for monolayer WTe2 to exhibit the topological property. The topological properties of monolayer WTe2 can potentially serve as a platform to realize essential operations in quantum computing." Cui's lab is already exploring new ways to manipulate the edge conduction channels and topological physics in monolayer WTe2. "We are looking into whether stacking monolayer WTe2 with other 2-D materials can alter its topological property," he said. "We are also using mechanical and chemical methods to create networks of conduction channels. The MIM technique we used offers a powerful means to characterize the conduction channels in topological materials such as monolayer WTe2."